BRUNEAU, FRANÇOIS-JACQUES, magistrate and councillor of Assiniboia; b. December 1809 at Lac Vert (Green Lake, Sask. ), illegitimate son of Antoine Bruneau and a pure Cree or a Métis; d. 26 June 1865 at Saint-Boniface (Man.). The father of François-Jacques Bruneau was probably a voyageur for the North West Company; he seems to have been related to Bruneaus prominent in Quebec society and also to Julie, wife of Louis-Joseph Papineau*. Since François-Jacques’ grandparents came from Poitou, he was of recent European origin, which was not common among the Métis. Those who could referred to themselves as grandchildren of “Frenchmen from France” in an effort to achieve equal footing with their half-breed compatriots, who were mostly of recent Scottish or English ancestry. In 1814 François-Jacques Bruneau went to Montreal with his father, where he was baptized on 28 October, and in 1822 came to the Red River Settlement. He registered in the Saint-Boniface school directed by Abbé Jean Harper; it became a classical college the following year. In 1827 he indicated a wish to enter the priesthood, news that could only please Bishop Joseph-Norbert Provencher* because of Bruneau’s ability to speak the Cree language. But in 1829, when he was in first year, the first student of the college to reach that level, he decided to become a teacher. He married Marguerite Harrison, daughter of a Cree mother and a North West Company employee, probably in 1831, and abandoned teaching for farming. The censuses of Assiniboia between 1832 and 1849 indicate how his family, his property and livestock, and his carts for the transport trade, all increased. Eleven children were born to him; one of his sons, Athanase, served as a guide to Lord Milton [Wentworth-Fitzwilliam*] and Dr Walter Butler Cheadle in 1862. By 1849, in terms of Assiniboia, Bruneau was well off. He had also become involved in civic affairs. In July 1843 he had appeared before the Council of Assiniboia as a leading Métis in a delegation requesting a distillery (which would give the Métis an opportunity to sell their grain surplus) and regular changes in the police force (so that more of them might share in the running of the country). 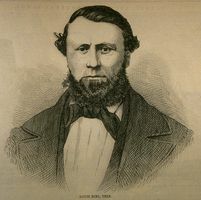 The return of Louis Riel Sr from Lower Canada during the summer of 1843 took the attention away from Bruneau until 1849. Bruneau did act as honorary deacon in 1845 at the ordination into the priesthood of Alexandre-Antonin Taché*, later bishop and archbishop of Saint-Boniface, but he took such a minor part in events at this time that he even stood aloof from the attempt to obtain the dismissal of Adam Thom*, the francophobe recorder of Rupert’s Land and councillor of Assiniboia. Bruneau was in a way typical of the Métis educated at Red River, who always remained diffident in the presence of the whites or half-breeds educated elsewhere. He was conciliatory, like the other Métis eventually named to the Council of Assiniboia, and easily influenced by established authority, civil or religious. Bruneau rallied to the Métis in the spring of 1849 when, with the arrest of Pierre-Guillaume Sayer* for infringing the Hudson’s Bay Company’s commercial monopoly, their discontent reached its climax. Bruneau joined a vigilance committee. He alone among its members sat on the jury at Sayer’s trial, although Riel was more in the public eye. Bruneau did not, however, sign the petition presented to the Council of Assiniboia in May 1849 after the trial requesting the removal of Thom and the appointment of a bilingual recorder and of French speaking Canadians and Métis to the council. Still he was one of two French Canadians and three Métis, “men of common sense able to judge soundly,” recommended for appointment to the council by Bishop Provencher and approved by the Métis at a large gathering prior to their summer hunt. George Simpson*, the governor of Rupert’s Land, did not share the bishop’s opinions, however, and the company in London hesitated when he spoke of illiterates. 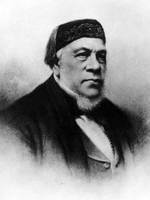 Only Abbé Louis-François Laflèche* was made a councillor, in July 1850. At this time, Bishop Provencher once again urged upon Simpson the importance of naming French Canadians and Métis to the council. Simpson, then at Red River, looked more carefully at Bruneau’s candidacy, and finally recommended him to the London authorities as “a man of sound standing in the settlement & of fair education” whose appointment would promote peace among “the Canadian Half-breeds [who] form a very large proportion of the inhabitants, and feel that they are not put on a footing of equality with the other classes in the community.” In 1851, Simpson’s suggestion received the support of Eden Colvile*, the governor of Rupert’s Land, who also desired the appointment of Bruneau, among others, as a means of balancing the clerical element in the council. Bruneau had been named magistrate in one of Assiniboia’s judicial districts in the fall of 1850, and in 1851 was made its president or judge. On 29 March 1853 he finally took the oath as councillor of Assiniboia, the second French speaking layman after Cuthbert James Grant* to do so. He soon occupied a variety of posts paying annual salaries between £12 and £25, including that of judge in several districts. He attended council regularly but was not a vocal member. According to contemporaries, Bruneau was approachable and courteous. A man of simple tastes, he liked to read books borrowed from the library of the HBC or of the bishop. On two occasions he defended his tutor, Bishop Provencher, in the Nor’Wester when it did not sufficiently recognize his contribution as an educator and civilizing influence in Red River. Bruneau always had great respect for Provencher and his successor, Taché, although he did not always share their attitudes in civil matters; he disapproved, for example, of Taché’s stand in council for a duty on alcoholic beverages to curb their importation. Bruneau, who knew how to conciliate the more powerful, proposed and got accepted an amendment to exempt imports from Britain. Bruneau died in 1865, a victim of a typhoid epidemic in the colony that also killed his wife. In 1870 only three of their daughters and one of their sons were living. He had served the authority of the HBC faithfully, without harming the interests of his Métis compatriots but also without contributing greatly to their political, social, or economic advancement. ACAM, RLB, 2, p.54. Archives de l’archevêché de Saint-Boniface (Man. ), Notes de Mgr Cloutier sur les commencements de l’histoire religieuse de ce pays. Cours donnés les jeudis par Mgr Taché à partir du 15 décembre 1881 à la fin de mai 1882; Registres des baptêmes, mariages et sépultures, paroisse Saint-Boniface, 1825–35, 28 juin 1865. Archives de la Société historique de Saint-Boniface (Man. ), Dossier François Bruneau. Archives de l’évêché de Trois-Rivières, Correspondance Taché-Laflèche, 18 juill. 1865. HBC Arch. D.4/23, 5 Jan., 21 April 1838; D.4/70, 30 June 1849; D.4/71, 9 May, 2, 5 July 1850; D.5/25, 27 June 1849; D.5/34, 16 Aug. 1852; E.5/6, ff.3d.–4; E.5/7, ff.19d.–20; E.5/8, ff.3d.–4; E.5/9, ff.4d.–5; E.5/10, ff.4d.–5; E.5/11, ff.3d.–4 (mfm. at PAC). PAC, MG 9, E3, 1–3. Les bourgeois de la Compagnie du Nord-Ouest: récits de voyages, lettres et rapports inédits relatifs au Nord-Ouest canadien, L.-F.-R. Masson, édit. (2v., Québec, 1889–90; réimpr. New York, 1960), I, 59, 400. Canadian North-West (Oliver), I, 38–39, 63, 66–67, 80, 307, 352, 361, 368, 389–555. J. J. Hargrave, Red River (Montreal, 1871), 349. HBRS, XIX (Rich and Johnson), lxxxiii–lxxxv, xc, cxiv, 208. [J.-N. Provencher], “Lettres de Monseigneur Joseph-Norbert Provencher, premier évêque de Saint-Boniface, Manitoba,” Soc. historique de Saint-Boniface, Bull., III (1913), 94, 120, 122, 127. Nor’Wester, 14, 28 Feb., 14, 28 April 1860; 1 April, 14 Sept. 1861; 6 July, 3 Aug. 1865. Morice, Dict. historique des Canadiens et Métis, 53–54. Giraud, Le Métis canadien, 902–3, 905–63. Ross, Red River Settlement (1957), 239. A.-H. de Trémaudan, Histoire de la nation métisse dans l’Ouest canadien ([Montréal, 1935]), 135. F.-J. Audet, “François Bruneau,” BRH, XXXVII (1931), 274–78, 600–1. J.-J. Lefebvre, “La vie sociale du grand Papineau,” RHAF, XI (1957–58), 483–84. [Louis] Mailhot, “François Bruneau,” Les Cloches de Saint-Boniface (Saint-Boniface, Man. ), XLV (1946), 69–72. Lionel Dorge, “BRUNEAU, FRANÇOIS-JACQUES,” in Dictionary of Canadian Biography, vol. 9, University of Toronto/Université Laval, 2003–, accessed April 24, 2019, http://www.biographi.ca/en/bio/bruneau_francois_jacques_9E.html.